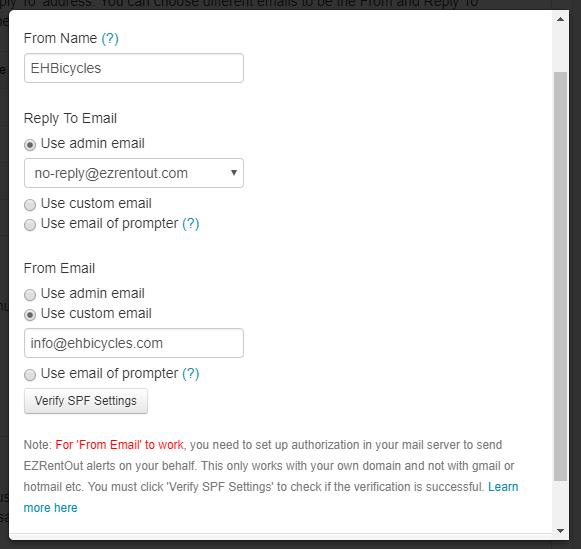 In EZRentOut, system generated emails are sent from no-reply@ezrentout.com to customers. By default, emails regarding an equipment return date, or a booking starting date are sent from the EZRentOut domain. You can choose to send these emails from an email address that belongs to you or your company. 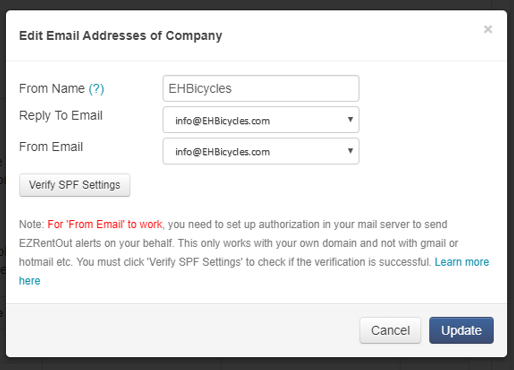 You can enable this feature from Settings → Company Settings –> Company Profile → System Generated Emails. An email has a sender ‘From Email‘ address and a recipient ‘Reply to Email‘ address. You can set both of these addresses as your own email address OR you can only change the ‘Reply To Email’ address while keeping the ‘From Email’ address as no-reply@ezrentout.com. To change the ‘From Email’ address, you need to set up the authorization in your DNS settings. This will send EZRentOut alerts on your behalf. When changing the ‘From Email’ address, hit ‘Verify SPF Settings’ to avoid any error (These settings may take up to 48 hours to take place). The configuration process has been explained below. Note: Domains that belong to you or your company can be configured on your EZRentOut account. Popular SMTP servers such as Gmail, Yahoo, Hotmail are not supported. An SPF (Sender Policy Framework) record is a list of servers that are allowed to send e-mails from your domain. This reduces spam activity that may be perceived to originate from your domain, which is known as source address spoofing. Also, it will drive the traffic directly to your domain. SPF records are really just a simple list of “approved” servers that are allowed to send e-mail from your domain. – Publishing an SPF record that uses -all instead of ~all may result in delivery problems. Save your changes. Keep in mind that changes to DNS records may take up to 48 hours to propagate throughout the Internet. Businesses often need to set up and prioritize email alerts at different stages of their workflow. You can also use different email addresses for sending out alerts on Purchase and Work Orders. These email addresses can be applied to both the ‘From’ and ‘Reply To’ addresses. Go to Settings → Company Settings –> Company Profile → System Generated Emails. Click the Edit button in the Actions column. Here, you can define whether you want to use an admin email address, a custom email address (e.g. info@ehbicycles.com), or the email address of a prompter (the user who triggered an action on a purchase or work order). Again, when changing the ‘From Email’ address, hit ‘Verify SPF Settings’ to avoid any error (These settings may take up to 48 hours to take place). Note: For these settings to work properly, Purchase Orders and Work Orders must be enabled in Settings → Add Ons. To see the type of email alerts that can be sent out to Admins/Account Owners/Staff Users once you configure the ‘From Email’, click here. To see the type of email alerts that will be sent out to Customers once you configure the ‘From Email’, click here. If you have any further questions, write to us at support@ezrentout.com. This entry was posted in [Support], Feature, productivity and tagged company domain, emails, system generated emails by admin. Bookmark the permalink.